CHICAGO, USA -- Ukraine’s plight against Russia is getting a lot of support from Chicagoans and a couple of U.S. Senators. Sens. John McCain (L), and Mark Kirk meet with the media following an event with members of the Chicago-area Ukrainian-American community at the Ukrainian Cultural Center in Chicago. 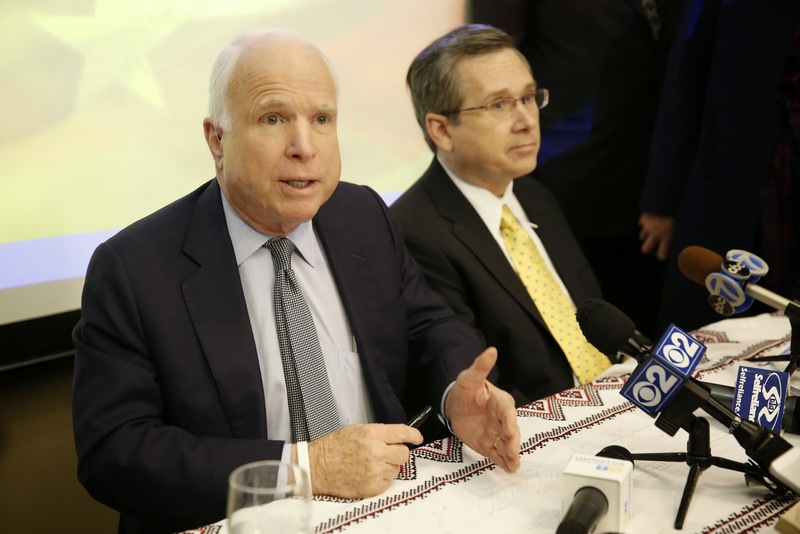 At the Ukrainian Cultural Center a standing room only crowd listened to Illinois’ Mark Kirk and Arizona’s John McCain talk about how more U.S. support for the Ukraine is needed. McCain told them Russia’s president isn’t going to stop with just that country. “Vladimir Putin’s ambitions are to restore the Russian Empire and that doesn’t just mean Ukraine, but it means first and foremost Ukraine because Ukraine was where the Russian Empire began,” McCain said. McCain says he’s embarrassed by the United States’ refusal to send lethal weapons to the Ukrainian army. “We should send the Ukrainians anti-tank weapons, we should send offensive, lethal weaponry,” Kirk said. The crowd treated the two senators like rock stars, especially when McCain joked about being sanctioned by Putin. “It means I can’t spend spring break in Siberia again,” he said.